After sharing my Morning Skin Care Routine with you I figured I had better share my steps at night as well! 1. Cleansing Water - I start off by removing all of my makeup with this Marcelle Cleansing Water. It's important to remove your makeup before actually cleansing, so that you can clean your skin, rather than just move around that layer of makeup on your face. P.S. The one that I linked to is actually different from the one I have pictured. Funny story - this is my absolute favourite cleansing water. Bioderma has nothing on it. There, I said it. Anyway, at one point I kept seeing my lovely cleansing water on sale, but the tags kept saying "clearance" and since I knew the products weren't close to expiring I kind of freaked out thinking that they might have decided to discontinue the product. Next thing I know I'm heading to every London Drugs, Shoppers Drugs Mart, and even Target (before their exit from Canada) near me to stock up on as many bottles as I could carry. I knew I would have to find another brand to replace it, so I tried out different ones that failed miserably, but I did so while I still had my favourite brand to take over when the other ones failed. At a much later date I was browsing the cosmetics aisle at Shoppers (a favourite - but expensive - habit of mine) when I came across a bottle like the one I linked to and then it all became clear - they were just re-releasing the product in fancier packaging so they had to clear out the older ones. Imagine my relief! I have yet to try the new one because, as I said, I am pretty well stocked on my old favourite. As far as I can tell it will be the same - the naming changed slightly, the packaging seems to have vastly improved, and I know the cost went up, but it's still very affordable in my opinion. Once I try it out I will be sure to share about it. Also, if you ever want to hear about my process of trying to find a replacement cleansing water let me know! 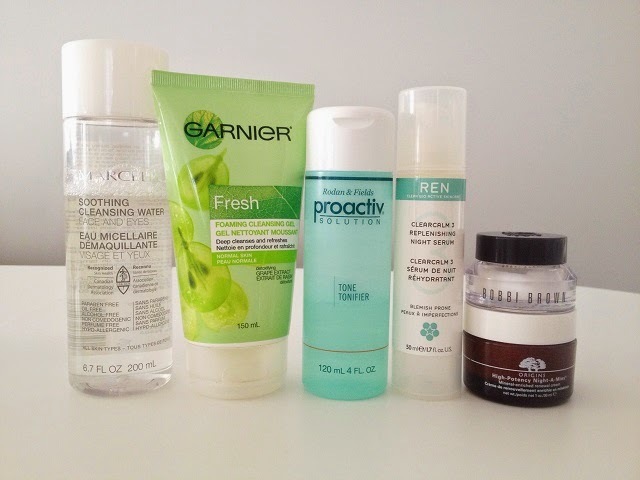 I tried out quite a few brands (Bioderma is still awesome - it's definitely my second favourite). 2. Cleanser - Just the same as my morning routine, I enjoy using this Garnier cleanser at night. This is the one I use if I'm washing my face at the sink, but if I shower I generally use a scrub or a different cleanser that I keep in my shower (I have so many cleansers in my shower - it's bad!). 3. Toner - Another item that is the same as my morning routine, this ProActiv toner does the trick, but I'm going to try out a different toner once this one is finished up. I used the toner from the seaweed line at The Body Shop previously and someone's comment on my Morning Skin Care Routine reminded me of how much I enjoyed it, so I might go back to that. If you have any other suggestions, though, I would love to hear, I'm still not totally decided! By the way, if you're interested in trying out the seaweed line, I highly recommend getting the Seaweed Skin Care Starter Kit so you can try a bit of everything. I bought it twice! 4. Serum - Currently my nighttime serum is the Ren ClearCalm 3 Replenishing Night Serum. I bought this on a whim online from Sephora one time, and it's not horrible, but I'm really just using it to get through it. It looks like this exact product has been discontinued, but it has been replaced by the ClearCalm 3 Replenishing Gel Cream - maybe the new product is better? I really enjoy gel-like consistencies, so it actually sounds pretty appealing. 5. Eye Cream - This Hydrating Eye Cream from Bobbi Brown is fantastic! I use it at night because it is a little heavier - it's still totally wearable during the day, but I like to use different ones in the morning and night to get different benefits. This used to be a pain to get in Canada, especially living in Saskatchewan, but I did a little looking around online while writing this post and it looks like you can now get Bobbi Brown shipped to Canada, so that's awesome! When I first found this eye cream I bought it in Las Vegas and I had been waiting for months to be able to buy it. My second jar was bought once Bobbi Brown was finally carried at my Sephora in Saskatoon, but it still couldn't be ordered online. 6. Moisturizer - The Origins High-Potency Night-A-Mins came in that first set I bought with the GinZing Moisturizer, and I have been hooked since. I still haven't had to replace my first jar because I sometimes use pure coconut oil as a moisturizer at night instead, so I don't go through it as fast. They have two formulas, one for combination-dry skin and one for combination-oily skin. I don't know if there was an option with the set, but I ended up with the one for combination-dry skin and, even though I definitely am more of the combination-oily skin type, I really like this formula. It's super moisturizing for night and even though it feels a bit heavier when I put it on, I wake up with lovely, dewy, youthful, glowing skin and that I am absolutely a fan of. The smell is super great too! Do you have a different skin care routine from morning to night? What are your favourite products? Any recommendations for something I should try? Yeah, it seems like a lot of steps, but when you're actually doing them it ends up taking very little time. The only one that I would say is fine to skip (but I still notice the benefits when I include it) is serum. Serum maximizes the benefits of the moisturizer, but you could go straight from toner to eye cream to moisturizer - I tend to leave the serum at home when I'm traveling and I need to really cut down on what I'm bringing. I love seeing other people's skin care routines. It's like a secret peek into their daily lives you don't see besides with blogging really! I am such a skin care nut, and yet I always remove my makeup and wash my face in the same step. What you said makes so much sense...I am a covert before Ive even tried it! Thank you for the tips! I'm glad you found my tip helpful!